Measuring 36" x 36", this platform provides a safe, stable walkway over facility obstacles when combined with stairs and handrails. Join multiple platforms in a single line to create greater linear clearance, or join platforms in a square to create a landing level. Tower supports are needed for spans greater than 108", and for unsupported outside edges and corners of deck created. Able to bear a total capacity of 450 lbs., each platform is easily bolted to stairs, tower supports, ladders or other platforms using universal bolt hole locations. Rated to meet and exceed ASCE 7-10 Table 4-2 (Catwalks for maintenance access = 40 PSF). 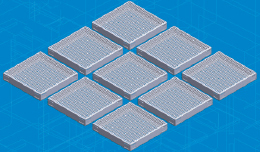 These platforms can be configured into multiple shapes to fit your crossover or mezzanine access needs. No additional supports are needed unless linear run exceeds 3 platforms. Each platform is manufactured from a single piece of metal using stamping technology that reduces welds, parts and piecing, while increasing strength and durability. The finished platform results in a slip resistant walk surface that offers secure traction.